Apple announced the fifth-generation Apple TV with support both 4K and HDR video. The new Apple TV 4K supports HDR in both the HDR 10 and Dolby Vision standards. Automatic detection of a 4K TV’s capabilities optimizes setup for the best quality picture. Apple TV 4K will also offer 4K HDR content from popular video services, including Netflix and Amazon Prime Video. 4K HDR movies on iTunes will be the same price as HD movies, and users will get automatic upgrades of HD titles in their purchased iTunes movies to 4K versions for no additional charges. Besides the upgrade of hardware and resolution, it also supports AirPlay 2 and HomeKit accessories - Apple TV is the perfect addition to any household. 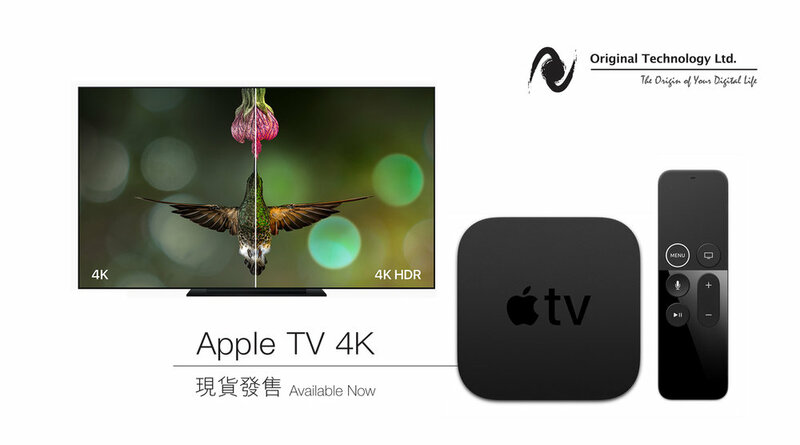 Apple TV 4K is available at Original now and you can purchase the Belkin 4K UltraHD HDMI 2.0 Cable at promotional price of MOP198 (list price MOP298) together with Apple TV. Visit our stores for more information.